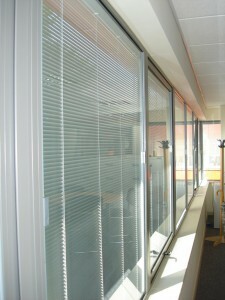 With Sunshade integral Venetian blinds there are no old fashioned cords or wands for controls. Our Integral blinds in double glazed units have hand controlled powerful permanent magnets running either side of the sealed unit. The magnets are discrete and unobtrusive, are smooth to operate and never wear out. They give a contemporary and stylish look to integral Venetian blinds that tilt and turn, as well as raise and lower. Sunshade integral Venetian blinds come in fourteen colours, that’s almost twice the colour range of other integral blinds manufacturers. Whilst many people have their Sunshade integral Venetian blinds colour co-ordinated so that the slats match the cassettes, it is possible to have both the blinds and the cassettes in any of the in any of the fourteen colours available so there are 371 combinations of colours available. Using St Gobain Planitherm Total + as a standard low emissivity coating in sealed units containing the Sunshade integral Venetian blinds gives less tinting and clearer vision. The Planitherm coating is more thermally efficient than many alternatives which leads to greater heat retention and thus lower heating bills. As the inner glass surface is warmer there is less (or no) condensation and less chance of a ‘haze’ as with other coatings. Best of all, it is specifically designed for Window Energy Ratings (WERs)and makes ‘A’ ratings more easily achievable. There are many advantages of the Sunshade integral Venetian blinds over competitors. With no wands or cords the Sunshade blinds pose less risk to children and pets, have a more aesthetic and contemporary look and have no cords to wear or get dirty and frayed. If an integral (or interstitial) Venetian blind is required in black, there is only one manufacturer in the UK who can supply it – Sunshade Blind Systems. No other UK manufacturer can supply a black cassette with black slats in an integral Venetian blind. The supply chain stretching across Europe and beyond means the delivery time for an integral Venetian blind is normally four to six weeks. However with Sunshade integral Venetian blinds a standard delivery of four weeks is normal. This means installations take place quicker and job completion is sooner; advantages to the installer and the end user. Sunshade Blind Systems has BSI accreditation BSEN1279 pt3 which denotes excellence in the manufacture of flat double glazing units and the ongoing assessment and testing assures customers of Sunshade’s commitment to providing quality products. An extremely motivated workforce on the manufacturing floor coupled with dedicated Sales and Technical staff mean that Sunshade Blind Systems is always ready and able to meet all customers’ glass and integral Venetian blind requirements. Sunshade integral Venetian blinds are assembled and permanently sealed within the double glazing cavity. Once sealed in this totally dust-free environment, the blinds require no cleaning, always appears new and are protected from damage. 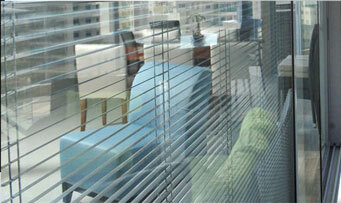 Blinds are available in Venetian format and can be operated by sliding magnets, cord or electric. All blinds are manufactured in accordance with high technical specifications and stringent production standards. 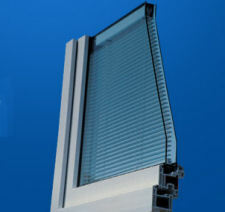 The slat raising, lowering and tilting functions are achieved using magnetic transmission through the glass, guaranteeing the units hermetic seal. An electrically operated system with numerous options is available.